"Alpinist" redirects here. For the magazine, see Alpinist (magazine). For the practice of closed-circuit diving without a bailout, see Rebreather § Bailout. "Mountaineer" redirects here. For other uses, see Mountaineer (disambiguation). "Basecamp" redirects here. For the online project manager, see Basecamp (software). For the live music service, see Basecamp Productions. For the most commonly referred to basecamp, see Everest Base Camp. "Mountain Climbing" redirects here. For the album by the American rock band Mountain, see Climbing! Mountaineering is the set of activities that involves ascending mountains. Mountaineering-related activities include traditional outdoor climbing, hiking, skiing, and traversing via ferratas. Indoor climbing, sport climbing and bouldering are usually considered mountaineering as well. While mountaineering began as attempts to reach the highest point of unclimbed big mountains, it has branched into specializations that address different aspects of mountains, depending on whether the route chosen is over rock, snow, or ice or on level ground. All require various degrees of experience, athletic ability, and technical knowledge to maintain safety. It is still common to venture out and seek the summits of peaks, whether unclimbed or not; this practice is known as peak bagging. Mountaineering is often called alpinism, and mountain climbers are sometimes called alpinists, although use of the term may vary between countries and eras. The word "alpinism" was born in the 19th century to refer to climbing for the purpose of enjoying climbing itself as a sport or recreation, distinct from merely climbing while hunting or as a religious pilgrimage that had been done generally at that time. The UIAA, the International Climbing and Mountaineering Federation, is the International Olympic Committee-recognized world governing body for mountaineering and climbing, addressing issues like access, medical, mountain protection, safety, youth, and ice climbing. Historically, many cultures have harbored superstitions about mountains, which they often regarded as sacred due to their perceived proximity with heaven, such as Mount Olympus for the Ancient Greeks. On April 26, 1336 famous Italian poet Petrarch climbed to the summit of 1,912 m (6,273 ft) Mount Ventoux overlooking the Bay of Marseilles, claiming to be inspired by Philip V of Macedon's ascent of Mount Haemo, making him the first known alpinist. One of the first European mountains visited by many tourists was Sněžka. This was mainly due to the relatively minor technical difficulties ascent and the fact that since the sixteenth century, many resort visitors flocked to the nearby Cieplice Śląskie-Zdrój (at the time Bad Warmbrunn) and highly visible Sněžka, visually dominant over all Krkonoše was for them an important attraction. The first confirmed ascent took place in the year 1456. In 1492 Antoine de Ville, lord of Domjulien and Beaupré, was the first to ascend the Mont Aiguille, in France, with a little team, using ladders and ropes. It appears to be the first recorded climb of any technical difficulty, and has been said to mark the beginning of mountaineering. In 1573 Francesco De Marchi and Francesco Di Domenico ascended Corno Grande, the highest peak in the Apennine Mountains. During the Enlightenment, as a product of the new spirit of curiosity for the natural world, many mountain summits were surmounted for the first time.. In 1741 Richard Pococke and William Windham made a historic visit to Chamonix. In 1757 Swiss scientist Horace-Bénédict de Saussure made the first of several unsuccessful attempts on Mont Blanc in France, finally offering a reward, which was claimed in 1786 by Jacques Balmat and Michel-Gabriel Paccard. By the early 19th century many of the alpine peaks were reached, including the Grossglockner in 1800, the Ortler in 1804, the Jungfrau in 1811, the Finsteraarhorn in 1812, and the Breithorn in 1813. In 1808 Marie Paradis became the first female to climb Mont Blanc, followed in 1838 by Henriette d'Angeville. The beginning of mountaineering as a sport in the UK is generally dated to the ascent of the Wetterhorn in 1854 by English mountaineer Sir Alfred Wills, who made mountaineering fashionable in Britain. This inaugurated what became known as the Golden age of alpinism, with the first mountaineering club - the Alpine Club - being founded in 1857. Prominent figures of the period include Lord Francis Douglas, Florence Crauford Grove, Charles Hudson, E. S. Kennedy, William Mathews, A. W. Moore, Leslie Stephen, Francis Fox Tuckett, John Tyndall, Horace Walker and Edward Whymper. Well-known guides of the era include Christian Almer, Jakob Anderegg, Melchior Anderegg, J. J. Bennen, Michel Croz, Johannes Zumtaugwald. In the early years of the "golden age", scientific pursuits were intermixed with the sport, such as by the physicist John Tyndall. In the later years, it shifted to a more competitive orientation as pure sportsmen came to dominate the London-based Alpine Club and alpine mountaineering overall. One of the most dramatic events was the spectacular first ascent of the Matterhorn in 1865 by a party led by English illustrator Edward Whymper, in which four of the party members fell to their deaths. This ascent is generally regarded as marking the end of the mountaineering golden age. By this point the sport of mountaineering had largely reached its modern form, with a body of professional guides, equipment and fixed guidelines. Mountaineering in the Americas became popular in the 1800s. In North America, Pikes Peak (14,415 ft (4,394 m)) in the Colorado Rockies (discovered in 1806) was first climbed by Edwin James and two others in 1820. Though lower than Pikes Peak, the heavily glaciated Fremont Peak (13,745 ft (4,189 m)) in Wyoming was thought to be the tallest mountain in the Rockies when it was first climbed by John C. Frémont and two others in 1842. Pico de Orizaba (18,491 ft (5,636 m)), the tallest peak in Mexico and third tallest in North America, was first climbed by U.S. military personnel which included William F. Raynolds and a half dozen other climbers in 1848. Heavily glaciated and more technical climbs in North American were not achieved until the late 19th and early 20th centuries. In 1897 Mount Saint Elias (18,008 ft (5,489 m)) on the Alaska-Yukon border was summitted by the Duke of the Abruzzi and party. But it was not until 1913 that Denali (20,237 ft (6,168 m)), the tallest peak in North America, was successfully climbed by Hudson Stuck. Mount Logan (19,551 ft (5,959 m)), the tallest peak in Canada was first summitted by a half dozen climbers in 1925 in an expedition that took more than two months. In 1879-1880 the exploration of the highest Andes in South America began when English mountaineer Edward Whymper climbed Chimborazo (20,564 ft (6,268 m)) and explored the mountains of Ecuador. The Cordillera between Chile and Argentina was visited by Paul Güssfeldt in 1883, who ascended the volcano Maipo (17,270 ft (5,260 m)) and attempted to climb the tallest mountain in the Americas, Aconcagua (22,837 ft (6,961 m)) that same year but was unsuccessful. The summit of Aconcagua was finally reached on January 14, 1897 by Swiss mountaineer Matthias Zurbriggen during an expedition led by Edward FitzGerald that began in December 1896. The Andes of Bolivia were first explored by Sir William Martin Conway in 1898, who later visited the mountains of Tierra del Fuego on the southern tip of South America. It took until the late 19th century for European explorers to penetrate Africa. Mount Kilimanjaro in Africa was climbed in 1889 by Austrian mountaineer Ludwig Purtscheller and German geologist Hans Meyer, Mt. Kenya in 1899 by Halford Mackinder, and a peak of Ruwenzori by H. J. Moore in 1900. 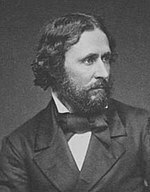 Focus shifted toward the exploration of other ranges such as the Pyrenees and the Caucasus Mountains; the latter owed much to the initiative of D. W. Freshfield who was the first man to conquer the summit of Mount Kazbek. Most of its great peaks were successfully conquered by the late 1880s. New Zealand's Southern Alps were first visited in 1882 by the Irish mountaineer Rev. William Spotswood Green, and on December 25, 1894 Kiwi mountaineer Tom Fyfe and his party summitted Aoraki / Mount Cook. By the turn of the 20th century, mountaineering had acquired a more international flavour. The last and greatest mountain range was the Himalayas in Central Asia. They had initially been surveyed by the British Empire for military and strategic reasons. In 1892 Sir William Martin Conway explored the Karakoram Himalayas, and climbed a peak of 23,000 ft (7,000 m) In 1895 Albert F. Mummery died while attempting Nanga Parbat, while in 1899 D. W. Freshfield took an expedition to the snowy regions of Sikkim. In 1899, 1903, 1906, and 1908 American mountaineer Mrs. Fanny Bullock Workman (one of the first professional female mountaineers) made ascents in the Himalayas, including one of the Nun Kun peaks (23,300 ft (7,100 m)). A number of Gurkha sepoys were trained as expert mountaineers by Charles Granville Bruce, and a good deal of exploration was accomplished by them. In 1902 the Eckenstein-Crowley Expedition, led by English mountaineer Oscar Eckenstein and English occultist Aleister Crowley was the first to attempt to scale Chogo Ri (now known as K2 in the west). They reached 22,000 feet (6,700 m) before turning back due to weather and other mishaps. Undaunted, in 1905 Crowley led the first expedition to Kangchenjunga, the third highest mountain in the world. Four members of the party were killed in an avalanche and they failed to reach the summit. Eckenstein was also a pioneer in developing new equipment and climbing methods. He started using shorter ice axes which could be used single-handed, designed the modern crampons and improved on the nail patterns used for the climbing boots. By the 1950s, all the eight-thousanders but two had been climbed starting with Annapurna in 1950 by Maurice Herzog and Louis Lachenal on the 1950 French Annapurna expedition. The last great peak was the highest of them all, Mount Everest. The British had made several attempts in the 1920s; the 1922 expedition reached 8,320 metres (27,300 ft) before being aborted on the third summit attempt after an avalanche killed seven porters. The 1924 expedition saw another height record achieved but still failed to reach the summit with confirmation when George Mallory and Andrew Irvine disappeared on the final attempt. The summit was finally reached on May 29, 1953 by Sir Edmund Hillary and Tenzing Norgay from the south side in Nepal. Just a few months later, Hermann Buhl made the first ascent of Nanga Parbat (8,125 m), a siege-style expedition culminating in a last 1,300 meters walking alone, being under the influence of drugs: pervitin (based on the stimulant methamphetamine used by soldiers during World War II), padutin and tea from coca leaves. K2 (8,611 m), the second-highest peak in the world, was first scaled in 1954 by Lino Lacedelli and Achille Compagnoni. In 1964, the final eight-thousander to be climbed was Shishapangma (8,013 m), the lowest of all the 8,000 metre peaks. Mountaineering techniques vary greatly depending on location, season, and the particular route a mountaineer chooses to climb. Mountaineers train to climb on all types of terrain whether it be snow, glacier, glacial Ice, water ice, or rock. Each type of terrain presents its own hazards. Climbers must be skilled in dealing with the different challenges that could arise from different terrain. While hikers may ascend mountains, and hiking may be considered a form of mountaineering, most consideration is given to technical skills required to traverse difficult terrain. Compacted snow conditions allow mountaineers to progress on foot. Frequently crampons are required to travel efficiently over snow and ice. Crampons attach to a mountaineer's boots to provide additional traction on hard snow (névé) and ice. Using various techniques from alpine skiing and mountaineering to ascend/descend a mountain is a form of the sport by itself, called ski mountaineering. Ascending and descending a snow slope safely requires the use of an ice axe and many different footwork techniques that have been developed over the past century, mainly in Europe (e.g. French technique and German technique). The progression of footwork from the lowest angle slopes to the steepest terrain is first to splay the feet to a rising traverse, to kicking steps, to front pointing the crampons. The progression of ice axe technique from the lowest angle slopes to the steepest terrain is to use the ice axe first as a walking stick, then a stake, then to use the front pick as a dagger below the shoulders or above, and finally to swinging the pick into the slope over the head. These various techniques may involve questions of differing ice-axe design depending on terrain, and even whether a mountaineer uses one or two ice axes. Anchors for the rope in snow are sometimes unreliable, and include the snow stakes, called pickets, deadman devices called flukes which are fashioned from aluminium, or devised from buried objects that might include an ice axe, skis, rocks or other objects. Bollards, which are simply carved out of consolidated snow or ice, also sometimes serve as anchors. When travelling over glaciers, crevasses pose a grave danger. These giant cracks in the ice are not always visible as snow can be blown and freeze over the top to make a snowbridge. At times snowbridges can be as thin as a few inches. Climbers use a system of ropes to protect themselves from such hazards. Basic gear for glacier travel includes crampons and ice axes. Teams of two to five climbers tie into a rope equally spaced. If a climber begins to fall the other members of the team perform a self-arrest to stop the fall. The other members of the team enact a crevasse rescue to pull the fallen climber from the crevasse. Multiple methods are used to travel safely over ice. The lead climber can place ice screws in the ice and attach the rope for protection. Each climber on the team must clip past the anchor, and the last climber picks up the anchor itself. Occasionally, slinged icicles or bollards are also used. This allows for safety should the entire team be taken off their feet. This technique is known as Simul-climbing and is sometimes also used on steep snow and easy rock. If the terrain becomes too steep, standard ice climbing techniques are used in which each climber is belayed, moving one at a time. Alpine rock climbing involves technical skills including the ability to place traditional protection (cams, nuts, hexes) into the rock to safely ascend a mountain. Climbers will climb multiple pitches of rock in order to reach the top. Typically, teams of 2 will climb with one leader placing the protection, and a follower belaying. The leader will reach a point on the rock to build an anchor. This anchor could be created by using slings around a tree, a large rock horn or boulder, or by using protection devices like cams and nuts to build an anchor in cracks. Once anchored, the leader will then belay the follower up to their position. The leader will then transfer all the necessary protection devices (known as a rack) to the follower. The follower then becomes the leader and will ascend the next pitch. This process will continue until the climbers either reach the top, or run into different terrain. In alpine climbing, it is common for climbers to see routes of mixed terrain. This means climbers may need to move efficiently from climbing glacier, to rock, to ice, back and forth in a number of variations. A single rock climber may sometimes engage alone in extreme challenges. Alex Honnold made a free solo climb of El Capitan, while two friends filmed his ascent. "Basecamp" redirects here. For other uses, see Base camp (disambiguation). Climbers use a few different forms of shelter depending on the situation and conditions. 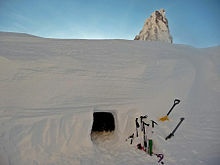 Shelter is a very important aspect of safety for the climber as the weather in the mountains may be very unpredictable. Tall mountains may require many days of camping on the mountain. The "base camp" of a mountain is an area used for staging an attempt at the summit. Base camps are positioned to be safe from the harsher conditions above. There are base camps on many popular or dangerous mountains. Where the summit cannot be reached from base camp in a single day, a mountain will have additional camps above base camp. For example, the southeast ridge route on Mount Everest has Base Camp plus (normally) camps I through IV. The European alpine regions, in particular, have a network of mountain huts (called "refuges" in France, "rifugi" in Italy, "cabanes" in Switzerland, "Hütten" in Germany and Austria, "Bothies" in Scotland, "koča" in Slovenia, "planinarski dom" in Montenegro, "chaty" in Slovakia, "schroniska" in Poland, "refugios" in Spain, "hytte" or "koie" in Norway, and "cabane" in Romania). Such huts exist at many different heights, including in the high mountains themselves – in extremely remote areas, more rudimentary shelters may exist. The mountain huts are of varying size and quality, but each is typically centred on a communal dining room and have dormitories equipped with mattresses, blankets or duvets, and pillows; guests are expected to bring and use their own sleeping bag liners. The facilities are usually rudimentary, but, given their locations, huts offer vital shelter, make routes more widely accessible (by allowing journeys to be broken and reducing the weight of equipment needing to be carried), and offer good value. In Europe, all huts are staffed during the summer (mid-June to mid-September) and some are staffed in the spring (mid-March to mid-May). Elsewhere, huts may also be open in the fall. Huts also may have a part that is always open, but unmanned, a so-called winter hut. When open and manned, the huts are generally run by full-time employees, but some are staffed on a voluntary basis by members of alpine clubs (such as Swiss Alpine Club and Club alpin français) or in North America by Alpine Club of Canada. The manager of the hut, termed a guardian or warden in Europe, will usually also sell refreshments and meals, both to those visiting only for the day and to those staying overnight. The offering is surprisingly wide, given that most supplies, often including fresh water, must be flown in by helicopter, and may include glucose-based snacks (such as candy bars) on which climbers and walkers wish to stock up, cakes and pastries made at the hut, a variety of hot and cold drinks (including beer and wine), and high carbohydrate dinners in the evenings. Not all huts offer a catered service, though, and visitors may need to provide for themselves. Some huts offer facilities for both, enabling visitors wishing to keep costs down to bring their own food and cooking equipment and to cater using the facilities provided. Booking for overnight stays at huts is deemed obligatory, and in many cases is essential as some popular huts, even with more than 100 bed spaces, may be full during good weather and at weekends. Once made, the cancellation of a reservation is advised as a matter of courtesy – and, indeed, potentially of safety, as many huts keep a record of where climbers and walkers state they plan to walk to next. Most huts may be contacted by telephone and most take credit cards as a means of payment. In the UK the term "hut" is used for any cottage or cabin used as a base for walkers or climbers. These are mostly owned by mountaineering clubs for use by members or visiting clubs and generally do not have wardens or permanent staff, but have cooking and washing facilities and heating. In the Scottish Highlands small simple unmanned shelters without cooking facilities known as "bothies" are maintained to break up cross country long routes and act as base camps to certain mountains. In the mountaineering context, a bivouac or "biv(v)y" is a makeshift resting or sleeping arrangement in which the climber has less than the full complement of shelter, food and equipment that would normally be present at a conventional campsite. This may involve simply getting a sleeping bag and Bivouac sack/bivvy bag and lying down to sleep. Typically bivvy bags are made from breathable waterproof membranes, which move moisture away from the climber into the outside environment while preventing outside moisture from entering the bag. Many times small partially sheltered areas such as a bergschrund, cracks in rocks or a trench dug in the snow are used to provide additional shelter from wind. These techniques were originally used only in emergency; however some climbers steadfastly committed to alpine style climbing specifically plan for bivouacs in order to save the weight of a tent when suitable snow conditions or time is unavailable for construction of a snow cave. The principal hazard associated with bivouacs is the greater level of exposure to cold and other elements present in harsh conditions high on the mountain. Tents are the most common form of shelter used on the mountain. These may vary from simple tarps to much heavier designs intended to withstand harsh mountain conditions. In exposed positions, windbreaks of snow or rock may be required to shelter the tent. One of the downsides to tenting is that high winds and snow loads can be dangerous and may ultimately lead to the tent's failure and collapse. In addition, the constant flapping of the tent fabric can hinder sleep and raise doubts about the security of the shelter. When choosing a tent, alpinists tend to rely on specialised mountaineering tents that are specifically designed for high winds and moderate to heavy snow loads. Tent stakes can be buried in the snow ("deadman") for extra security. Where conditions permit, snow caves are another way to shelter high on the mountain. Some climbers do not use tents at high altitudes unless the snow conditions do not allow for snow caving, since snow caves are silent and much warmer than tents. They can be built relatively easily, given sufficient time, using a snow shovel. The temperature of a correctly made snow cave will hover around freezing, which relative to outside temperatures can be very warm. They can be dug anywhere where there is at least four feet of snow. The addition of a good quality bivvy bag and closed cell foam sleeping mat will also increase the warmth of the snow cave. Another shelter that works well is a quinzee, which is excavated from a pile of snow that has been work hardened or sintered (typically by stomping). Igloos are used by some climbers, but are deceptively difficult to build and require specific snow conditions. Mountaineering is considered to be one of the most dangerous activities in the world. Loss of life is not uncommon on most major extreme altitude mountaineering destinations every year. Dangers in mountaineering are sometimes divided into two categories: objective hazards that exist without regard to the climber's presence, like rockfall, avalanches and inclement weather, and subjective hazards that relate only to factors introduced by the climber. Equipment failure and falls due to inattention, fatigue or inadequate technique are examples of subjective hazards. A route continually swept by avalanches and storms is said to have a high level of objective danger, whereas a technically far more difficult route that is relatively safe from these dangers may be regarded as objectively safer. In all, mountaineers must concern themselves with dangers: falling rocks, falling ice, snow-avalanches, the climber falling, falls from ice slopes, falls down snow slopes, falls into crevasses and the dangers from altitude and weather. To select and follow a route using one's skills and experience to mitigate these dangers is to exercise the climber's craft. Every rock mountain is slowly disintegrating due to erosion, the process being especially rapid above the snow-line. Rock faces are constantly swept by falling stones, which may be possible to dodge. 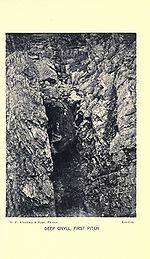 Falling rocks tend to form furrows in a mountain face, and these furrows (couloirs) have to be ascended with caution, their sides often being safe when the middle is stoneswept. Rocks fall more frequently on some days than on others, according to the recent weather. Ice formed during the night may temporarily bind rocks to the face but warmth of the day or lubricating water from melting snow or rain may easily dislodge these rocks. Local experience is a valuable help on determining typical rock fall on such routes. The direction of the dip of rock strata sometimes determines the degree of danger on a particular face; the character of the rock must also be considered. Where stones fall frequently debris will be found below, whilst on snow slopes falling stones cut furrows visible from a great distance. In planning an ascent of a new peak or an unfamiliar route, mountaineers must look for such traces. When falling stones get mixed in considerable quantity with slushy snow or water a mud avalanche is formed (common in the Himalayas). It is vital to avoid camping in their possible line of fall. The places where ice may fall can always be determined beforehand. It falls in the broken parts of glaciers (seracs) and from overhanging cornices formed on the crests of narrow ridges. Large icicles are often formed on steep rock faces, and these fall frequently in fine weather following cold and stormy days. They have to be avoided like falling stones. Seracs are slow in formation, and slow in arriving (by glacier motion) at a condition of unstable equilibrium. They generally fall in or just after the hottest part of the day. A skillful and experienced ice-man will usually devise a safe route through a most intricate ice-fall, but such places should be avoided in the afternoon of a hot day. Hanging glaciers (i.e. glaciers perched on steep slopes) often discharge themselves over steep rock-faces, the snout breaking off at intervals. They can always be detected by their debris below. Their track should be avoided. A rock climber's skill is shown by their choice of handhold and foothold, and their adhesion to the holds once chosen. Much depends on the ability to estimate the capability of the rock to support the weight placed on it. Many loose rocks are quite firm enough to bear a person's weight, but experience is needed to know which can be trusted, and skill is required in transferring the weight to them without jerking. On rotten rocks the rope must be handled with special care, lest it should dislodge loose stones on to those below. Similar care must be given to handholds and footholds, for the same reason. When a horizontal traverse has to be made across very difficult rocks, a dangerous situation may arise unless at both ends of the traverse there are firm positions. Mutual assistance on hard rocks takes all manner of forms: two, or even three, people climbing on one another's shoulders, or using an ice axe propped up by others for a foothold. The great principle is that of co-operation, all the members of the party climbing with reference to the others, and not as independent units; each when moving must know what the climber in front and the one behind are doing. After bad weather steep rocks are often found covered with a veneer of ice (Glossary of climbing terms#verglas), which may even render them inaccessible. Crampons are useful on such occasions. Every year, 120 to 150 people die in small avalanches in the Alps alone. The vast majority of alpine victims are reasonably experienced male skiers aged 20–35, but also include ski instructors and guides. However, a significant number of climbers are killed in Scottish avalanches, often on descent and often triggered by the victims. There is always a lot of pressure to risk a snow crossing. Turning back takes a lot of extra time and effort, supreme leadership, and most importantly there is seldom an avalanche that proves the right decision was made. Making the decision to turn around is especially hard if others are crossing the slope, but any next person could become the trigger. This type of avalanche occurs when a plate of snow breaks loose and starts sliding downhill; these are the largest and most dangerous. This type of avalanche is formed by hard-packed snow in a cohesive slab. The slab will not break up easily as it slides down the hill, resulting in large blocks tumbling down the mountain. This type of avalanche is formed again by a cohesive layer of snow bonded together, the slab tends to break up more easily. This type of avalanche is triggered by a small amount of moving snow that accumulates into a big slide. Also known as a "wet slide or point release" avalanche. This type of avalanche is deceptively dangerous as it can still knock a climber or skier off their feet and bury them, or sweep them over a cliff into a terrain trap. Dangerous slides are most likely to occur on the same slopes preferred by many skiers: long and wide open, few trees or large rocks, 30 to 45 degrees of angle, large load of fresh snow, soon after a big storm, on a slope "lee to the storm". Solar radiation can trigger slides as well. These will typically be a point release or wet slough type of avalanche. The added weight of the wet slide can trigger a slab avalanche. Ninety percent of reported victims are caught in avalanches triggered by themselves or others in their group. Ice avalanches are a hazard that exists in glaciated mountain ranges. They are caused by the collapse of unstable ice blocks from a steep or overhanging part of a glacier, referred to as a hanging glacier. Due to the fact that they are part of a glacier, ice avalanches can have large amounts of rock in them. Ice avalanches are quite dangerous because they can travel long distances, sometimes as far as 8 km out onto the glacier valley floor. Ice avalanches are a common everyday occurrence in ranges such as the Alaska Range, Saint Elias Mountains, or Columbia Icefield. They are also advised to have had avalanche training. Ironically, expert skiers who have avalanche training make up a large percentage of avalanche fatalities, perhaps because they are the ones more likely to ski in areas prone to avalanches, and certainly because most people do not practice enough with their equipment to be truly fast and efficient rescuers. Even with proper rescue equipment and training, there is a one in-five chance of dying if caught in a significant avalanche, and only a 50/50 chance of being found alive if buried more than a few minutes. The best solution is to learn how to avoid risky conditions. For travel on slopes consisting of ice or hard snow, crampons are a standard part of a mountaineer's equipment. While step-cutting can sometimes be used on snow slopes of moderate angle, this can be a slow and tiring process, which does not provide the higher security of crampons. However, in soft snow or powder, crampons are easily hampered by balling of snow, which reduces their effectiveness. In either case, an ice axe not only assists with balance but provides the climber with the possibility of self-arrest in case of a slip or fall. On a true ice slope however, an ice axe is rarely able to effect a self-arrest. As an additional safety precaution on steep ice slopes, the climbing rope is attached to ice screws buried into the ice. Snow slopes are very common, and usually easy to ascend. At the foot of a snow or ice slope is generally a big crevasse, called a bergschrund, where the final slope of the mountain rises from a snow-field or glacier. Such bergschrunds are generally too wide to be stepped across, and must be crossed by a snow bridge, which needs careful testing and a painstaking use of the rope. A steep snow slope in bad condition may be dangerous, as the whole body of snow may start as an avalanche. Such slopes are less dangerous if ascended directly, rather than obliquely, for an oblique or horizontal track cuts them across and facilitates movement of the mass. New snow lying on ice is especially dangerous. Experience is needed for determining the feasibility of advancement over snow in doubtful condition. Snow on rocks is usually rotten unless it is thick; snow on snow is likely to be sound. A day or two of fine weather will usually bring new snow into sound condition. Snow cannot lie at a very steep angle, though it often deceives the eye as to its slope. Snow slopes seldom exceed 40°. Ice slopes may be much steeper. Snow slopes in early morning are usually hard and safe, but the same in the afternoon are quite soft and possibly dangerous, hence the advantage of an early start. Crevasses are the slits or deep chasms formed in the substance of a glacier as it passes over an uneven bed. They may be open or hidden. In the lower part of a glacier the crevasses are open. Above the snow-line they are frequently hidden by arched-over accumulations of winter snow. The detection of hidden crevasses requires care and experience. After a fresh fall of snow they can only be detected by sounding with the pole of the ice axe, or by looking to right and left where the open extension of a partially hidden crevasse may be obvious. The safeguard against accident is the rope, and no one should ever cross a snow-covered glacier unless roped to one, or even better to two companions. Anyone venturing onto crevasses should be trained in crevasse rescue. The primary dangers caused by bad weather center on the changes it causes in snow and rock conditions, making movement suddenly much more arduous and hazardous than under normal circumstances. Whiteouts make it difficult to retrace a route while rain may prevent taking the easiest line only determined as such under dry conditions. In a storm the mountaineer who uses a compass for guidance has a great advantage over a merely empirical observer. In large snow-fields it is, of course, easier to go wrong than on rocks, but intelligence and experience are the best guides in safely navigating objective hazards. Summer thunderstorms may produce intense lightning. If a climber happens to be standing on or near the summit, they risk being struck. There are many cases where people have been struck by lightning while climbing mountains. In most mountainous regions, local storms develop by late morning and early afternoon. Many climbers will get an "alpine start", that is, before or by first light, so as to be on the way down when storms are intensifying in activity and lightning and other weather hazards are a distinct threat to safety. High winds can speed the onset of hypothermia, as well as damage equipment such as tents used for shelter. Under certain conditions, storms can also create waterfalls which can slow or stop climbing progress. A notable example is the Föhn wind acting upon the Eiger. Rapid ascent can lead to altitude sickness. The best treatment is to descend immediately. The climber's motto at high altitude is "climb high, sleep low", referring to the regimen of climbing higher to acclimatise but returning to lower elevation to sleep. In the South American Andes, the chewing of coca leaves has been traditionally used to treat altitude sickness symptoms. Common symptoms of altitude sickness include severe headache, sleep problems, nausea, lack of appetite, lethargy and body ache. Mountain sickness may progress to HACE (High Altitude Cerebral Edema) and HAPE (High Altitude Pulmonary Edema), both of which can be fatal within 24 hours. In high mountains, atmospheric pressure is lower and this means that less oxygen is available to breathe. This is the underlying cause of altitude sickness. Everyone needs to acclimatise, even exceptional mountaineers that have been to high altitude before. Generally speaking, mountaineers start using bottled oxygen when they climb above 7,000 m. Exceptional mountaineers have climbed 8000-metre peaks (including Everest) without oxygen, almost always with a carefully planned program of acclimatisation. Solar radiation increases significantly as the atmosphere gets thinner with increasing altitude thereby absorbing less ultraviolet radiation. Snow cover reflecting the radiation can amplify the effects by up to 75% increasing the risks and damage from sunburn and snow blindness. In 2005, researcher and mountaineer John Semple established that above-average ozone concentrations on the Tibetan Plateau may pose an additional risk to climbers. Some mountains are active volcanoes as in the case of the many stratovolcanoes that form the highest peaks in island arcs and in parts of the Andes. Some of these volcanic mountains may cause several hazards if they erupt, such as lahars, pyroclastic flows, rockfalls, lava flows, heavy tephra fall, volcanic bomb ejections and toxic gases. There are two main styles of mountaineering: expedition style and alpine style. Alpine style are typically found climbing in medium-sized glaciated mountain areas such as the Alps or Rocky Mountains. Medium-sized generally refers to altitudes in the intermediate altitude (7,000 to 12,000 ft) and first half of high altitude (12,000 to 18,000 ft) ranges. However, alpine style ascents have been done throughout history on extreme altitude (18,000 to 29,000 ft) peaks also, albeit in lower volume to expedition style ascents. Alpine style refers to a particular style of mountain climbing that involves a mixture of snow climbing, ice climbing, rock climbing, and glacier travel, where climbers generally single carry their loads between camps, in a single push for the summit. "Light and fast" is the mantra of the alpine mountaineer. The term "alpine style" contrasts with "expedition style" (as commonly undertaken in the Himalayan region or other large ranges of the world), which could be viewed as slow and heavy, where climbers may use porters, pack animals, glacier airplanes, cooks, multiple carries between camps, usage of fixed lines etc. A mountaineer who adopts this style of climbing is referred to as an expedition mountaineer. Expedition mountaineers still employ the skill sets of the alpine mountaineer, except they have to deal with expanded time scale, more severe weather exposure, and additional skills unique to expeditionary climbing. The prevalence of expedition style climbing in the Himalaya is largely a function of the nature of the mountains in the region. Because Himalayan base camps can take days or weeks to trek to, and Himalayan mountains can take weeks or perhaps even months to climb, a large number of personnel and amount of supplies may be helpful. This is why expedition style climbing is frequently used on large and isolated peaks in the Himalaya. In Europe and North America there is less of a need for expedition style climbing on most medium-sized mountains. These mountains can often be easily accessed by car or air, are at a lower altitude and can be climbed in a shorter time scale. Expedition style mountaineering can be found in the larger high altitude and extreme altitude North American ranges such as the Alaska Range and Saint Elias Mountains. These remote mountaineering destinations can require up to a two-week trek by foot, just to make it to base camp. Most expeditions in these regions choose a glacier flight to base camp. Route length in days from base camp can vary in these regions, typically from 10 days to 1 month during the climbing season. Winter mountaineering on major peaks in these ranges can generally consume between 30 and 90 days depending on the route, and can generally only be tackled via expedition style mountaineering during this season. A distinction can be made between high altitude tourism and unsupported ascents that are relevant to experienced practitioners. In addition to foregoing the use of porters or professional guides above basecamp, the standard since the late 20th century has been to ascend without oxygen support from cylinders. While ascents are still made with supplemental oxygen and with high altitude porter assistance they are considered irrelevant by experienced practitioners of the sport or commercial funding agencies. Only ascents without oxygen support are considered to be sporting. 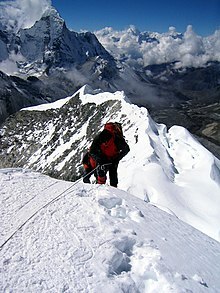 Mountaineering has become a popular sport throughout the world. In Europe the sport largely originated in the Alps, and is still immensely popular there. Other notable mountain ranges frequented by climbers include the Caucasus, the Pyrenees, Rila mountains, the Tatra Mountains and the rest of the Carpathian Mountains, as well the Sudetes. In North America climbers frequent the Rocky Mountains, the Sierra Nevada of California, the Cascades of the Pacific Northwest, the high peaks of The Alaska Range and Saint Elias Mountains. There has been a long tradition of climbers going on expeditions to the Greater Ranges, a term generally used for the Andes (e.g. the Cordillera Blanca in Peru) and the high peaks of Asia including the Himalayas (e.g. the Mount Everest of Nepal/Tibet/ India), Karakoram, Hindu Kush, Pamir Mountains, Tien Shan and Kunlun Mountains. In the past this was often on exploratory trips or to make first ascents. With the advent of cheaper, long-haul air travel, mountaineering holidays in the Greater Ranges are now undertaken much more frequently and ascents of even Everest and Vinson Massif (the highest mountain in Antarctica) are offered as a "package holiday". Other mountaineering areas of interest include the Southern Alps of New Zealand, the Coast Mountains of British Columbia, the Scottish Highlands, Cape fold mountains of South Africa and the mountains of Scandinavia, especially Norway. The true accessibility of mountaineering is found in a combination of factors that can be divided into typical destination accessibility and real (physical) accessibility. These two groups have then been subdivided into elements related to transport links and in situ services (in the case of destination accessibility) and to factors covering the social, economic, weather and psychophysical environments, as well as the presence of mountaineering activities (in the case of real accessibility). Destination accessibility is defined as the ability to provide appropriate access for visitors into a destination and also ensure all necessary services facilitating a convenient stay. Destination accessibility must be understood as the combination of: transport links factors, in situ services factors. While the factors that influence mountaineering destination accessibility (transport links and in situ services) are not much different from any other excursion, real accessibility factors are. Real accessibility may be dependent (in a positive or negative way) upon social factors, economic factors, weather factors, psychophysical factors, and carrying capacity factors. ^ "Nepal Mountaineering Association". web page. 2008. Retrieved 2 June 2011. ^ Whitlock, W., Van Romer, K., & Becker, H. (1991). Nature Based Tourism: An Annotated Bibliography Clemson SC: Strom Thurmond Institute, Regional Development Group. ^ Beedie, P., & Hudson, S. (2003). Emergence of mountain-based adventure tourism. Annals of Tourism Research, 30(3), 625–643. ^ a b Cox, Steven M.; Fulsaas, Kris, eds. (2009) . Mountaineering: The Freedom of the Hills (7th ed.). Seattle: The Mountaineers. ISBN 978-0-89886-828-9. ^ Ghazali Musa; James Higham; Anna Thompson- Carr (5 June 2015). Mountaineering Tourism. Taylor & Francis. ISBN 978-1-317-66873-2. ^ "Matt Helliker on alpinism". www.coachmag.co.uk. Retrieved 1 December 2015. ^ "UIAA Activities". UIAA. Retrieved 2015-01-02. ^ "1865: The Golden Age of Mountaineering". ^ Claire Eliane Engel (1950), A History of Mountaineering in the Alps, chapter VII. ^ Mackinder, Halford John (May 1900). "A Journey to the Summit of Mount Kenya, British East Africa". The Geographical Journal. 15 (5): 453–476. doi:10.2307/1774261. JSTOR 1774261. ^ Rowell, Galen (1977). In The Throne Room of the Mountain Gods. San Francisco: Sierra Club Books. pp. 36–40. ISBN 978-0-87156-184-8. ^ Vasarhelvi, Elizabeth Chai; Chin, Jimmy. "Opinion | What if He Falls?". New York Times. Retrieved 3 November 2018. ^ a b c d e f g Cymerman, A; Rock, PB. "Medical Problems in High Mountain Environments. A Handbook for Medical Officers". USARIEM-TN94-2. US Army Research Inst. of Environmental Medicine Thermal and Mountain Medicine Division Technical Report. Retrieved 2009-03-05. ^ Singh, L. K. (February 2008). Indian Cultural Heritage Perspective For Tourism. Gyan Publishing House. ISBN 9788182054752. ^ a b c Hamilton, AJ. "Biomedical Aspects of Military Operations at High Altitude". USARIEM-M-30/88. US Army Research Inst. of Environmental Medicine Thermal and Mountain Medicine Division Technical Report. Retrieved 2009-03-05. ^ a b Roach, Robert; Stepanek, Jan & Hackett, Peter. (2002). "24". Acute Mountain Sickness and High-Altitude Cerebral Edema. In: Medical Aspects of Harsh Environments. 2. Borden Institute, Washington, DC. Retrieved 2009-01-05. ^ Roach, James M. & Schoene, Robert B. (2002). "25". High-Altitude Pulmonary Edema. In: Medical Aspects of Harsh Environments. 2. Borden Institute, Washington, DC. Retrieved 2009-01-05. ^ Muza, SR; Fulco, CS; Cymerman, A (2004). "Altitude Acclimatization Guide". US Army Research Inst. Of Environmental Medicine Thermal and Mountain Medicine Division Technical Report (USARIEM–TN–04–05). Retrieved 2009-03-05. ^ "Mountainous plateau creates ozone "halo" around Tibet". University of Toronto. December 7, 2005. Archived from the original on 2008-04-11. Isserman, Maurice; Weaver, Stewart (2008). Fallen giants: a history of Himalayan mountaineering from the age of empire to the age of extremes. New Haven: Yale University Press. ISBN 978-0-300-16420-6. OCLC 181424034. Ortner, Sherry B. (1999). Life and death on Mt. Everest : Sherpas and Himalayan mountaineering. Princeton: Princeton University Press. ISBN 978-0-691-00689-5. OCLC 41326318. Unsworth, Walt (1994). Hold the heights: the foundations of mountaineering. Seattle: The Mountaineers. ISBN 978-0-89886-379-6. OCLC 28547900. Wikimedia Commons has media related to Mountaineering. Wikisource has the text of the 1905 New International Encyclopedia article Mountain Climbing. Wikivoyage has travel information for Mountaineering.